Which Nylabone ® Chew Should You Choose for Your Dog? Nylabone makes a chew for just about every dog. You should get know your dog's chewing style. You have a responsibility to select the proper size and formulation appropriate for your dog’s breed, size and chewing strength. The only Nylabone® products intended for consumption are Healthy Edibles®, Quest Multi-Care Dental System, NutriDent and Nutritionally Enhanced® lines of "treat" bones. These bones are meant to be consumed, and are therefore not long lasting chews. Nylabone makes several lines of non-edible products for a dog's long-term chewing needs. 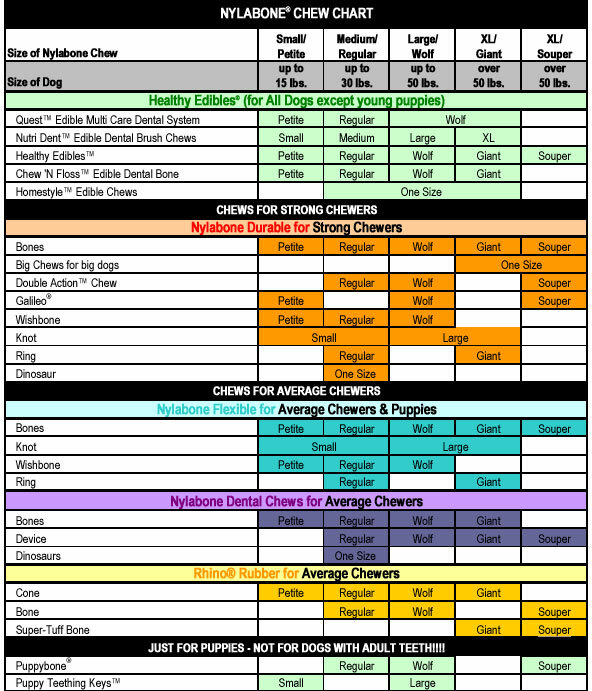 Among these are the Durables™ (nylon) recommended for strong, determined chewers; and three formulations for the gentle or occasional chewer: Flexible™ (polymer), Rhino® (rubber), and Cheeky Squeaky Pets™ (fleece ). While non-toxic, these products are made of inert materials, and are not edible or digestible. **As with all Pet toys, you should supervise your dog's use. The number of edible "treat" bones appropriate for a single day depends upon the dog's age, weight and activity level. These chews are not recommended for young puppies. Please check with your veterinarian as to what your dog's daily caloric intake should be, and the proper time to introduce this type of product into his diet. Frequently inspect your Nylabone before giving it to your dog, to make sure it's whole and intact, with no missing pieces. To clean, scrub with a brush under warm water, using mild, non-toxic detergent, and rinse thoroughly. Nylabone Chews and Toys should NOT be autoclaved, boiled, placed in the dishwasher, washing machine, convection or microwave oven.